2. Meanwhile, toast the pitta bread lightly and, when cool enough to handle, tear into bitesize chunks. Stir together the remaining oil and the vinegar. Add the pitta, cucumber, tomatoes, mint and salad onions. Sprinkle over the sumac, season and toss. Set aside; the bread will soften slightly. 3. Heat a griddle pan over a high heat. Season the lamb and cook for 4-5 minutes per side for medium rare. 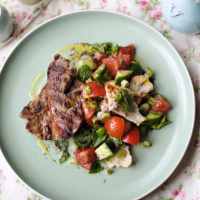 Serve with the pitta salad. This recipe was first published in Fri Jul 14 16:00:00 BST 2017.